From CTWD, This is Dean Kirkland with BlockBytes! Presented by DASH. Made for payments, DASH is the ultimate digital currency for both brick-and-mortar and online merchants. -The 11-count federal indictment filed against 12 Russian intelligence officers alleges that digital currency was used to fund their covert activities and provided an anonymous cover against the Democratic National Committee and Hillary Clinton’s 2016 presidential campaign. -Major League Baseball is releasing a crypto-based collectors game that runs on the ethereum blockchain. Influenced by the highly popular, cryptokitties, the game has been referred to baseball collecting for the 21st century. -The United Nations reported yesterday that it has created a ‘High-Level 20-member panel on Digital Cooperation,’ focused specifically on blockchain technology. -Swiss based, The Tezos Foundation, has announced a new grant program for crypto-developers that will advance the Tezos community and platform. The formal call for grant proposals will be made next month. -South Korea is hoping to pass new legislation that would simplify blockchain investing and further promote the technology nationally. Thank you for listening, From Crypto the WonderDog This is Dean Kirkland with BlockBytes. 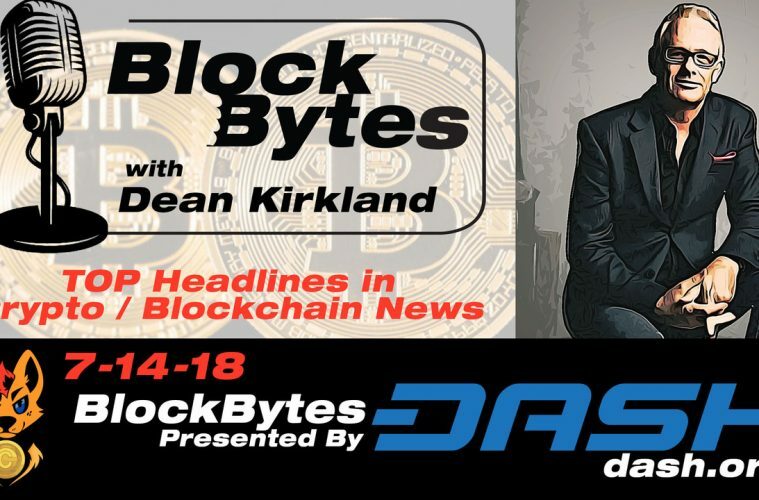 BlockBytes is presented by DASH. DASH digital currency continues to innovate cryptocurrency acceptance both online and at local retailers. DASH makes payments easy… have you DASH’ed lately?